Spider-Man's most mysterious new enemy takes center stage in a 3-issue mini-series by Official Amazing Spider-Man Web-Head Fred Van Lente and newcomer Gianluca Gigliotta.<br />One-half benevolent philanthropist/One-half underworld mastermind, Mr. Negative has carved out a substantial slice of the big apple for himself over the past year. But when the super-villain mastermind The Hood strikes at the heart of Mr. 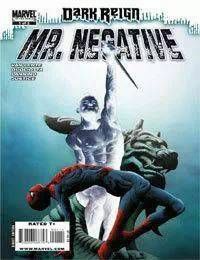 Negative's criminal operations with a whole horde of classic Arachno-Foes (including The Scorcher, Speed Demon, The Squid and the long awaited return of the White Rabbit), Spider-Man is left to clean up the mess between these two violent nemeses.